NASA's Dawn spacecraft obtained this image with its framing camera on July 18, 2011. It was taken from a distance of about 6,500 miles (10,500 kilometers) away from the protoplanet Vesta. The stark difference between daytime and night on the giant asteroid Vesta looms large in a new photo from NASA's Dawn spacecraft, which is currently orbiting the massive space rock. Dawn snapped the image of Vesta on July 18 from a distance of about 6,500 miles (10,500 kilometers) away, as it swooped across the asteroid's terminator — the boundary between the day and night sides. When compared to the Dawn probe's first close-up photo of Vesta, which NASA released on July 18, the new photo reveals a better view of the asteroid's surface beneath the spacecraft in the shadow of night. The asteroid turns on its axis once every five hours and 20 minutes, scientists said. 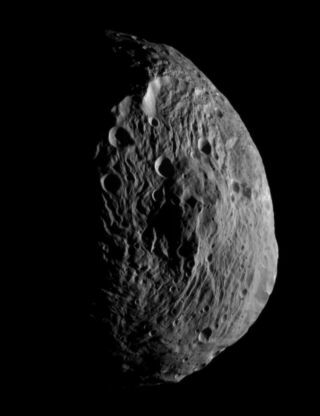 Dawn entered orbit around Vesta on July 15, beginning a yearlong mission to orbit and study the asteroid. Vesta, which measures about 330 miles (530 km) across, is the second-largest object in the main asteroid belt between Mars and Jupiter. It is also the brightest asteroid in the solar system. The Dawn spacecraft is expected to take detailed photos of Vesta and will closely study the huge space rock from three different orbits. Due to Vesta's large size, many astronomers classify it as a protoplanet, saying it would have continued to develop into a rocky planet like Earth or Mars if Jupiter's gravity had not wreaked havoc in the asteroid belt long ago. NASA's $466 million Dawn mission is the first prolonged visit to a large asteroid. After spending a year at Vesta, Dawn will leave its orbit to travel to the asteroid Ceres, which at 590 miles (950 km) wide, is the largest body in the main asteroid belt. Ceres is so large that it is considered to be a dwarf planet. Dawn is expected to reveal up-close views of Ceres, which should allow scientists to compare it to Vesta. Unlike the drier and more evolved Vesta, Ceres is considered to be more primitive and wet, possibly harboring water ice, researchers said. Dawn's observations may help astronomers understand more about the early days of the solar system, as well as the process that formed and shaped rocky planets like Earth. NASA's Dawn spacecraft launched in September 2007 and has since traveled more than 1.7 billion miles (2.7 billion km).